Heroes come in many different guises. This week it was the girls of Ms. Daly’s class who became super heroes. On one of their daily 10@10 trips to the park they noticed that there was some frog spawn in the fountain and monitored their progress every day since. It has been gloriously warm this week, much to our delight- however this meant trouble for the frog spawn as the fountain had dried up. It is not permitted to remove frog spawn except in serious life saving circumstance such as this and so the ladies of Ms. Daly’s responded quickly and rescued all the frog spawn. Every class was given a chance to inspect our new visitors, including some very lively tadpoles!!! Well done girls for saving the day!!! The students of 4th worked really hard creating the most wonderful projects on China whilst the students of 5th made their amazing projects on the French Revolution. Realising what a shame for others not to enjoy all this creativity and hard work both classes presented their projects to each other. Fantastic work everyone!! They look incredible! Ms. Conroy’s class studied the number 9 today with a little help from some fun games! Collecting data is always fun. Mr. Walsh’s class created their data by studying where their mothers come from. It transpires there is a fantastic representation of nations across the entire class. Well done everyone! These are some of the fabulous yarn paintings created by the artistic students in Ms. Reddan’s 5th class. Well done girls- they look fabulous! The smell of sizzling sausages wafted all over the corridors on Friday. The ladies and gentlemen of Ms. Waters’ and Ms. Daly’s class made delicious sausage sandwiches. Another day of wonderful active learning. The lucky crew!! The students of Ms. Waters’ also got very crafty during the week! Go big or go home- Scoil Mhuire came out in force to support our Jade and Lindsey’s special day. Thank you to everyone for getting involved. The socks were spectacular! Such a fun way to celebrate World Down Syndrome Day. Thank You- you Rock!! We hope that you are all enjoying another day off today. Just a reminder that tomorrow is Rock Your Socks!! A donation of €2 in aid of World Down Syndrome Day would be greatly appreciated and your flashiest, snazziest, socks are a must!!! Can’t wait to see you all tomorrow! Happy St. Patrick’s Day to one and all. 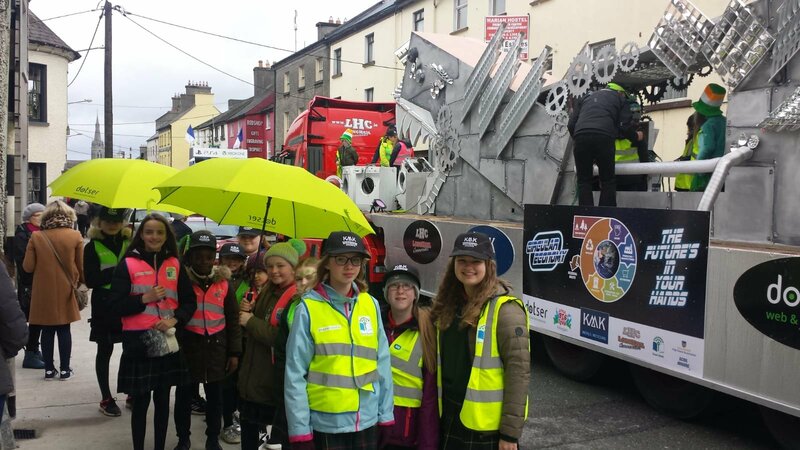 Well done to the members of our Green Team for representing Scoil Mhuire at today’s parade. You were amazing!! Thank you! Another highlight of our week was the performance by our Daltaí group. They certainly owned their Lord of the Dance backing track and wowed the audience with their incredible talent. Well done ladies- you were fantastic!